Today’s Proudly Not Made By Robots feature is a regular OG: Michelle. Michelle is a born-and-raised native of Ord, and is married to one of our founding partners, Jade. Michelle is fiercely loyal to her community, her friends and her family. She knows many of our regular customers better than anyone, as she probably grew up with many of them! She also was the most inviting individual my wife and I got to know when we moved to Ord. We’ve never forgotten how kindness and hospitality can help make someone feel like they’ve found their forever home, and Michelle was that person for us. What is your favorite SBC beer? Non-SBC beer? Sideburns’s Milk Stout (YUM! ); Brickway’s Coffee Vanilla Stout. Think back to your most memorable brewery experience: where any why? Our first day of opening and Caleb walking through the door with our license. We went through a lot to get that license! What do you do at SBC? I’m an owner, and work in our taproom. What is your favorite SBC event? 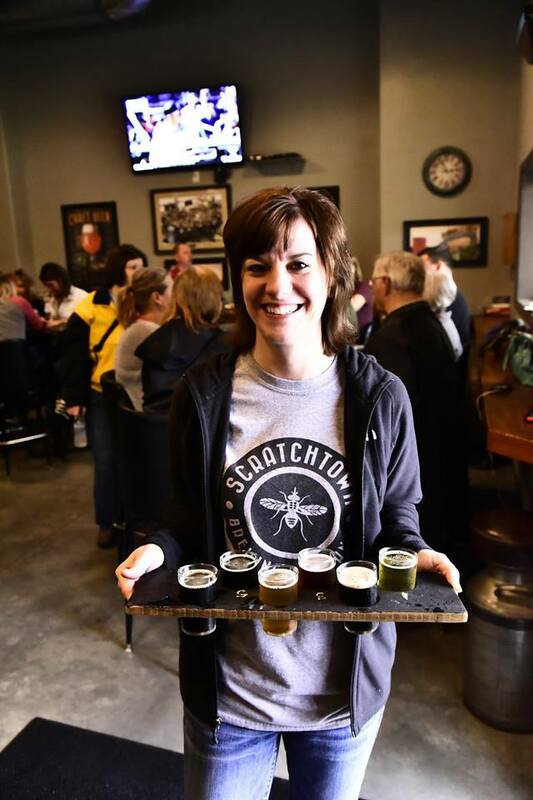 Scratchtoberfest, it’s such a fun day! What is one hobby you enjoy in your free time? Yoga. If you had a year to go on an adventure, where would you go and why? Alaska – I’ve never been and it looks like a wonderful place to visit and relax. What bit of advice would you give your 18 year old self? Don’t worry so much, friendship is about quality, not quantity. Live within your means, take care of your health, appreciate the little things, cherish your family, nothing good happens after midnight, and the best is yet to come! What do you want to be when you grow up? Retired! What is your favorite thing to do in nature? I am really enjoying learning to garden! What do you like best about working at SBC? Meeting new people each and every week. It’s pretty cool. What is one thing you would do to make the world a better place? Teach people to withhold judgement, practice compassion and be present.